If you are gardening for wildlife you want to take it slow and safe during your spring garden cleanup. You resisted the urge in the fall to be overly tidy and kindly left stalks with dried flower heads and native grasses standing over the winter. 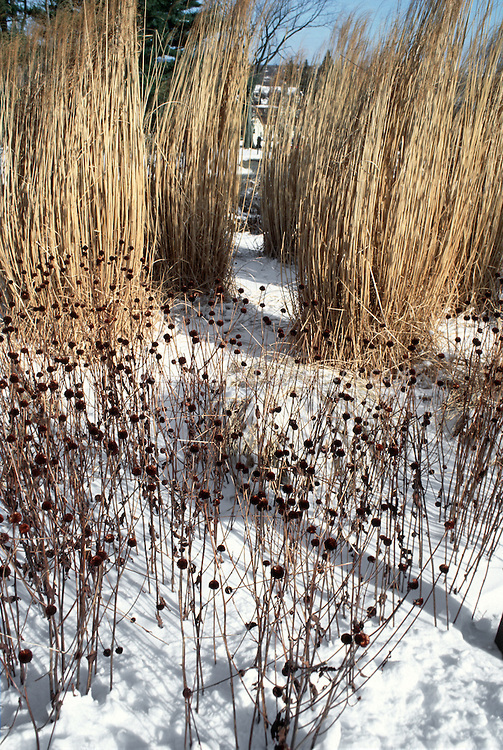 (See The Ecological Benefits of the Not So Perfect Yard) This gift to the winter garden not only provided beautiful dried flower heads and grasses as contrast against the snow, but supplied food while sheltering many of this season’s spiders, moths and butterflies, caterpillars and more. Now the days are starting to warm up and you are anxious to get out and take a peek at spring’s bounty beginning to poke up thru the debris. So how soon is too soon to begin? Gardening in the wildlife garden requires a change of mindset and a bit of patience while we wait for warmer weather to allow overwintering insects a chance to wake up from their winter nap and to move on. Our winter weather here the last couple of years has been extremely changeable. We have already experienced over 70° temperatures this season in February. Be prepared for those weather fluctuations and their impact upon your habitat garden. Wait for several 50° days to begin. Of course, the best time to remove dried stalks and grasses is before it becomes difficult to remove them without damaging new growth. 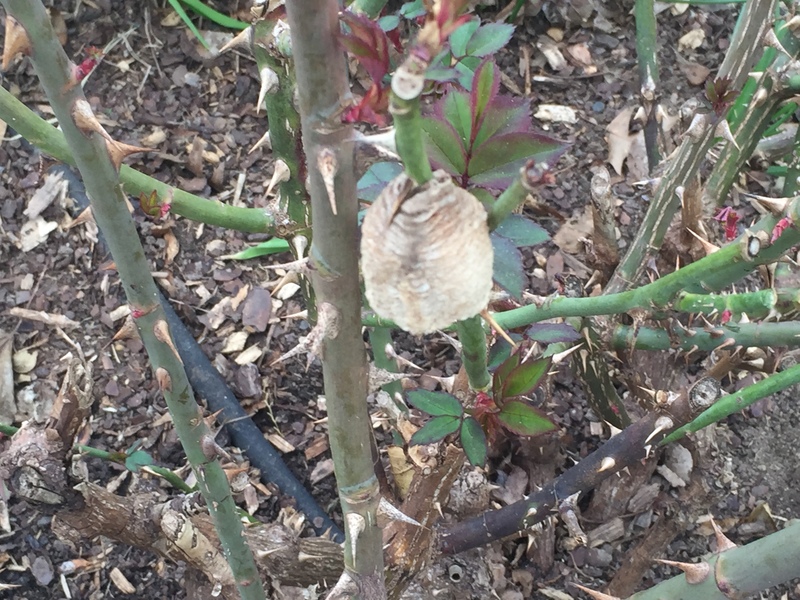 But be on the lookout for overwintering chrysalises, partially grown caterpillars curled up in leaves, or microscopic eggs on plant materials. I’ve started to remove dried flower stalks and grasses, but am leaving them lying about for a bit to give insects a chance to wake up and move on. Raking leaves out of the beds is also a bit of a no-no as they still provide late winter/early spring protection and also will break down and build up your soil. I leave the as many of the leaves in my beds as undisturbed as possible while still being sensitive to the overall appearance of the garden, particularly near hardscaping. The leaves in the back of the beds will remain untouched but the top loose layer of those near the front will be collected and eventually chopped up (along with those dried flower stalks and grasses) and returned as mulch to the garden in another month or so. This is not the purist approach, but one that I can live with balancing the needs to protect wildlife while gardening in a residential neighborhood. After that the bones of the garden are laid bare. Take your time with planting new plants and putting down mulch. Let your perennials emerge lest you dig up something you’ll regret. As the weather warms in April, it’s also a great time to tackle the weeds before they take over. Ground Ivy, Lesser Celandine and Bishop’s Weed are thugs in my garden. Try to get a jump on your garden thugs early. Now’s the time to plan for a new garden, if you didn’t do it last fall. I’ve about run out of lawn to remove and plant, but please do it if you can. Lawn contributes little if anything of ecological value for the wildlife garden. Spring is also a great time to take stock. What needs to be divided? What didn’t make it? What could be moved where? And, of course, what can I buy? As I am newer to gardening for wildlife, my garden still has a lot of exotics that don’t pull their weight and contribute to the food web. Little by little I am weeding out those non-contributors and adding native plants that do more for wildlife. If I see holes in my leaves and other imperfections, I am learning to look at them as not imperfections in an unsustainable goal, but rather as a way of providing life sustaining support for the myriad creatures in Mother Nature’s food web. As more than half of the world’s wildlife has vanished since 1970, creating habitat in residential neighborhoods by gardening for wildlife is critical to our planet’s ability to support our way of life. As I do my planning for the coming season, I need to consider those remaining non-natives in my garden that are invasive and really do need to be removed. For example, I love the color of Crimson Barberry and the contrast it provides; but this year those few remaining plants need to go. Something with berries perhaps to feed the birds, or a great host plant for butterflies? Look for the EGT/EEC flyer A Dirty Dozen of Invasive Species in NJ (sold commercially) for common invasive plants and recommendations for substitutes. For additional assistance check our EGT/EEC flyer Sustainable Spring Landscaping Tips. We also recommend the Garden for Wildlife program of the National Wildlife Federation as a wonderful resource. Follow their tips and certify your garden as a wildlife habitat. The best part about gardening for wildlife is that it is supports a somewhat laid back approach to gardening. Sure, there are garden chores to be done; but they are not as intense and unsustainable as the scraping the ground clean each season, buying and applying mulch, fertilizing, applying pesticides, deadheading… approach. Mother Nature will take care of a lot for us as gardeners and our native creatures if we just let her. That works for me and, I hope, for the countless displaced wildlife that desperately need a home. There are some really useful pieces of advice here. I must confess I raked up leaves a couple of weeks ago. Next year I will leave them be.